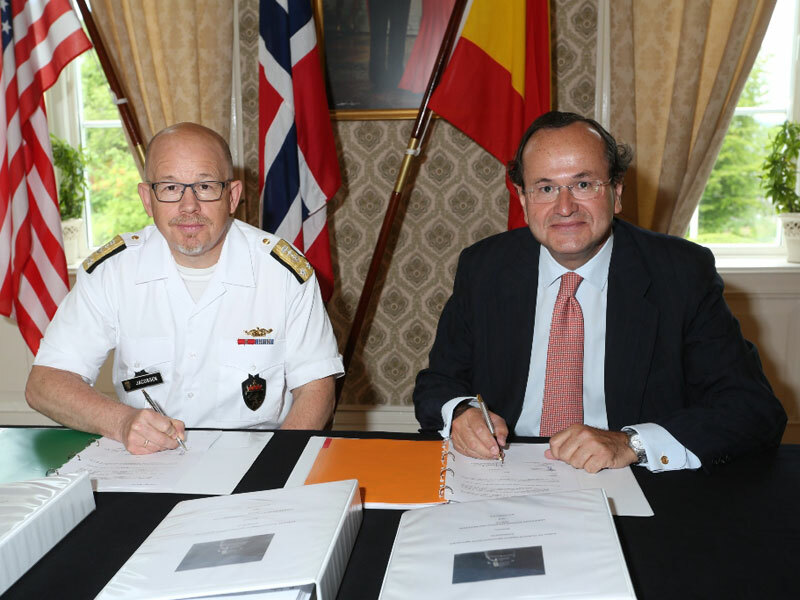 NDLO and Navantia have signed in Bergen a “Follow on Technical Support” for the maintaining and life support works of the F-310 class frigates built by Navantia, during the next 3 years. The contract has been signed by the Head of NDLO Naval Systems, Rear Admiral Morten Jacobesen and the Chairman of Navantia, José Manuel Revuelta. The F-310 class frigates contract, signed on 23rd. June 2000, has been a technological and operational success. The ships, equipped with the AEGIS Combat System, have proven their capabilities in international missions integrated with other first class Navies and have provided the Royal Norwegian Navy with the antisubmarine and anti-air warfare, according to high requirements from NDLO. The program of construction is considered successfully ended and the offset program is totally accomplished, which means this contract has generated positive industrial and commercial exchange that has enforced the relationship between Norway and Spain, and especially between Navantia and NDLO. The positive closure of the building contract and the excellent relationship has been essential for the formalization of this contract. With the signing of this long term contract, Navantia will put at the disposal of NDLO and RnoN all its knowledge, capacity, resources and the experience accumulated in the design and maintenance of this type of vessels for the Spanish Navy and other Navies around the world. The Spanish shipbuilder Navantia is a world reference in the design, construction and integration of state-of-the-art war ships, including new generation submarines, as well as ship repairs & modernizations. Navantia is also engaged in the design and manufacture of Integrated Platform Management Systems, Fire Control Systems, Command and Control systems, Propulsion Plants and through life support for all its products. Even though its main line of activity is in the naval field, Navantia designs and manufactures systems for the Army and the Air Force. Photo: Head of NDLO Naval Systems, Rear Admiral Morten Jacobesen (left) and the Chairman of Navantia, José Manuel Revuelta.